In early April 2006 I returned to Seoul to visit the offices of GoPets. I didn't really do any sight-seeing this time, so there aren't many pictures. 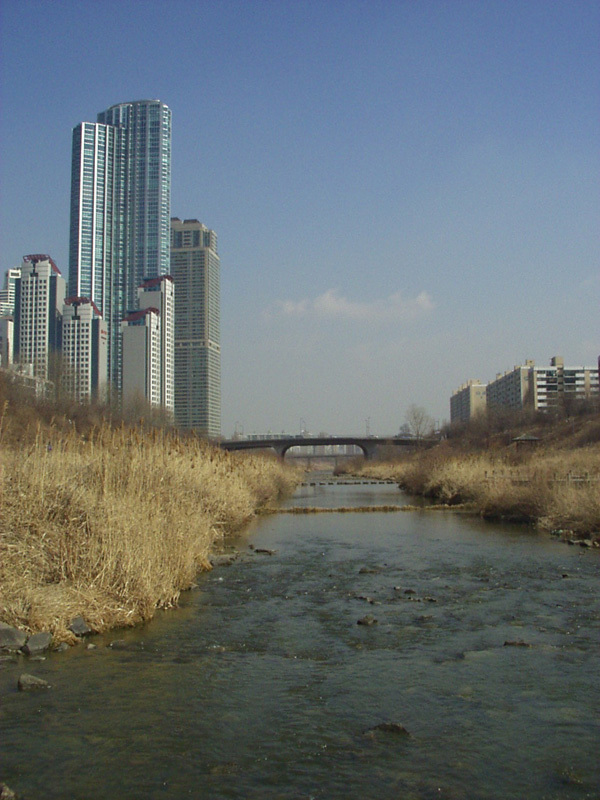 A picture of the stream that runs near GoPets offices. Compare to this picture taken a year earlier. A clear shot of the collection of buildings in the above picture. Almost everyone in Seoul lives in an apartment, and some of these apartment complexes are very large. I'm sure the closest building in this shot are apartments. The following pictures are from around the stream. The pathways on the sides of the stream are used for exercise. There are marking indicating different distances in kilometers. A train station that was a transfer point to get to the multi-building technology mall (see below). There are a series of buildings that act as one large technology mall where you can literally buy any gadget you can contemplate. Near (attached!) (part of!!) the technology mall is a train station. This picture of a sculpture also shows an outside show area. The exterior of a Red Mango ice cream shop. Red Mango is the first company to have branded merchandise in GoPets. Stargate technology comes to the COEX mall. OK, not really. At the large COEX shopping mall is a large bookstore. The book shown here is the Korean translation of Erik's book Game Development and Production. As an additional promotional item, the Korean version has GoPets graphics on the cover. I'm mentioned in the book. There is a screenshot of a Microsoft Project window showing my schedule for the (unpublished) game Black 9. ©2006 Joe Pearce. All rights reserved.